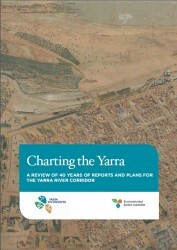 Published by the Yarra Riverkeeper Association and Environmental Justice Australia, 'Charting the Yarra' presents a review of the many past planning reports that focus on the Yarra River corridor. The report was launched on the occasion of the 10th anniversary celebration of the Yarra Riverkeeper Association. The report analyses over 40 years of reports on the Yarra corridor and, while many good reports have been written and many good recommendations made, many of those recommendations have not been implemented, to the river’s and Melbourne’s detriment. Three key issues facing the river have surfaced in this review: fragmentation of responsibility, inconsistencies in planning and a lack of continuity in implementing recommendations. Check out the report yourself.